The Days of Johann, an agility dog! : Colts vs Patriots! The Colts square off against the New England Patriots today and all predictions indicate the game promises to be a good one. Predictors say anything from Patriots 42, Colts 35 to Colts 24, Patriots 23. We'll be watching as we work on our blog and website today. Since I can't be in the game (I'm a sports nut you know! ), I sure wish I could kick back and view the game in one of those cool home theaters with some cool home theater seating. I'm sure Gracie would love some great seating too for when she likes to watch Animal Planet, her favorite show! Good luck to everyone with their favorite teams today! Boy, wouldn't dad love that home theater seating stuff to watch his NY Giants play! Should we add it to his Christmas list?! Enjoy the game! 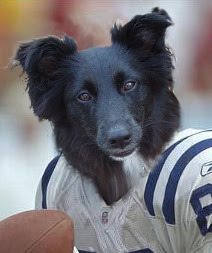 And given where I grew up, you know who I'll be cheering for ;) Go Colts!